ClaireSanders.net: Vermont to California Move! We did it! Alec and I made it across the United States with all our belongings. We used google maps to rough out the trip, but the real physical map we use was a Rand McNally road atlas. The atlas was invaluable, it's how we picked the state parks we camped at each night and it kept us on the right path. We had planned on sharing the driving time, but Alec quickly got the hang of the huge truck so I let him do the whole drive. Day 1: We picked up the 16 ft long Budget Truck at 8 am and packed in a rush running boxes down two flights of stairs. We had some some awesome help (Keny and Jon) with boxes and the pinball machine. We left White River Junction, Vermont around 1:30 pm and made it to New York state. That night we camped at Sampson State Park on Seneca Lake, one of the finger lakes. 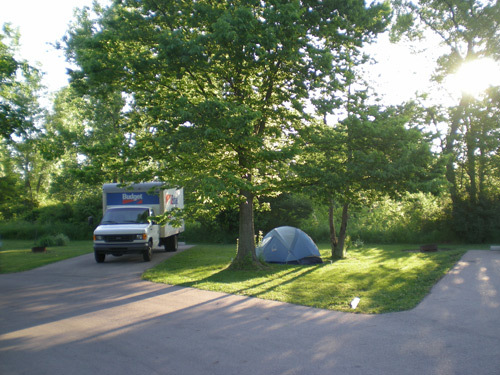 Day 2: Drove through New York, Pennsylvania, made it into Ohio and camped at Buck Creek State Park. Day 3: Drove through the rest of Ohio, Indiana, and Illinois then camped at Table Rock State Park, Missouri. 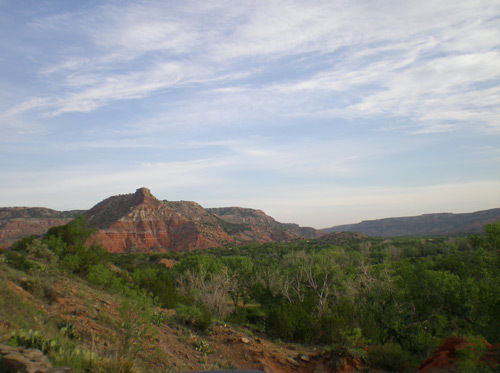 Day 5: Drove through the rest of Texas and into New Mexico. Stayed with my parents in Santa Fe, NM. Day 7: Drove through Arizona, visited my grandparents in Bullhead City, AZ. Made it into California and camped at Colonel Allensworth State Historical Park. Day 8: Drove the rest of the way through California to Oakland. Alec did an amazing job backing the truck into the apartment driveway with about 6 inch clearance on each side of the truck. We unloaded the truck in a rush because it's an active driveway. It was a very stressful hour, but we did it. Later in the day we got some friends to help get the pinball machine out of the truck. The greatest relief was returning the truck the next morning with the knowledge that we don't have to drive again for a long time. 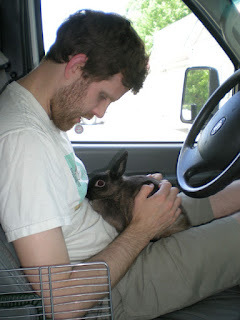 Traveling with two rabbits: All the things that I've read about traveling with rabbits mainly talks about how they hate it and get really stressed out. During the previous move from Oakland to Vermont, they did okay during four days of driving across the country. The most important thing to remember is to keep them cool, so air conditioning is a must. I put both of them in a small travel carrier and had them in the cab with us. They had a small water bottle, but the truck vibrations make it drip so they had water whenever we stopped, which was about every 2 hours. The first night they slept in the truck, it was cool and we thought the less they moved the more they would settle into the travel lifestyle. By the second night, we figured they could use some exercise so in an empty tent we let them hop around and they loved it. They spent the night in the tent with us in their carrier. That was the template for the rest of the trip. They would spend the day in the carrier and got a little hop about in the morning and evening as we were putting up or taking down the tent. 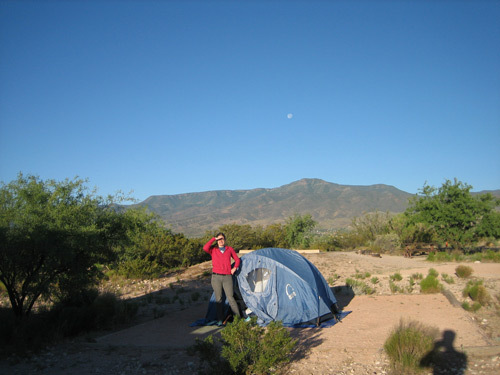 As we traveled south, it just got hotter and hotter, but luckily by staying in state parks the nights were always cool. They made it safely through another move and happily now have more space in the new apartment. They seem just as happy to be out of the truck as we are. 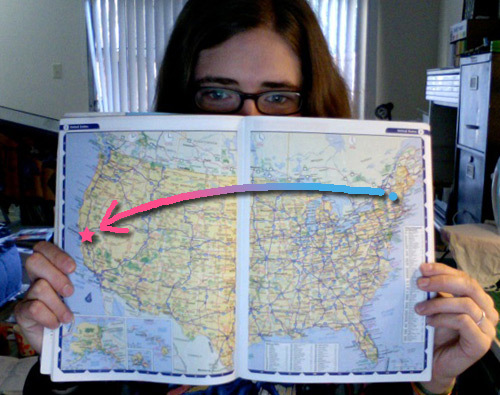 Alec and I have been planning our move back to the west coast for some time now. One of the biggest steps we took was flying out to Oakland mid-May to find an apartment before we moved out there. For the apartment hunt, I found a really helpful site called Padmapper.com. 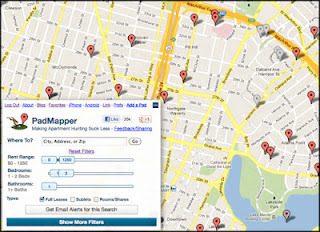 It was very useful for checking out places in Oakland while still in Vermont. It takes all the apartment listings on Craigslist and maps them out using google maps. Since I've lived in Oakland before it was great to have each listing pop up where the apartment is located. It lets you customize exactly what you're looking for: price, number of bedrooms, pets, etc. It also lets you overlay walkscore, crime maps and neighborhood names. Alec and I drove across the country from California to Vermont in the fall of 2010 and we took I-80 most of the way. For this trip we took the southern route and dipped down into New Mexico to visit my parents. 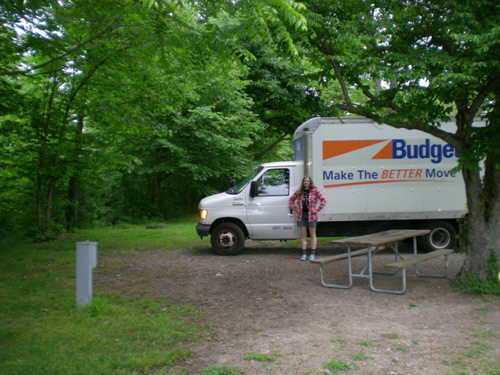 Since we were in a big moving truck, which couldn't cover too many miles each day. I had been looking up the driving directions on google maps, but I wanted to divide up the whole trip by specific mileage each day and I couldn't find that feature. 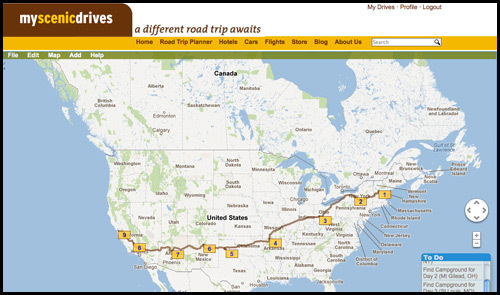 I ended up at Myscenicdrive.com which uses google maps but lets you create driving directions that will break down the trip by mileage or hours driving per day. This was really helpful, especially since we have a couple days where we'll be driving less than the others. 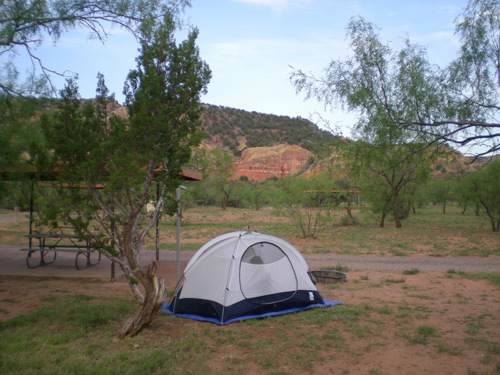 This site also gives you nearby campgrounds based on where you'll be stopping each day.